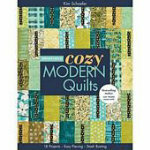 20 brand new quilts with an impressive variety of colorways and styles. Choose from lap quilts, wall hangings, or runners to cheer up your space and whip up a gift. Straightline piecing with squares and rectangles makes it quick bright, bold fabrics make it sophisticated. Pub: 7232012. 64 Pages.